One of the nice things about New England is the availability of really good fish chowder (and of course, clam chowder) in restaurants. However, I find it’s also nice to prepare my own at home — this mouth-watering, creamy (although not exactly slim!) version so easy to make, and the herbed crackers are really what make this dish. Delicious! Hope you’ll give this a try! Melt 3 Tbsp butter with thyme and rosemary in a large sauce pan over medium heat. Add a pinch each of salt and ground black pepper. Add oyster crackers and stir well to combine. Spread cracker mixture out in a single layer on a baking sheet. Place in oven and bake 10 minutes, until golden brown. Cook bacon over medium-high heat in a large sauce pan or Dutch oven. Stir until crisp, then transfer to paper towels using a slotted spoon. Drain off fat. Add onions, carrots, celery and 2 Tbsp butter to pan. Reduce heat to medium. Cook until vegetables have softened, about 10 minutes. Sprinkle flour over onion mixture and stir 3 minutes. Add paprika and stir another 30 seconds. Add clam juice, water and cream. Increase heat to medium high, add potatoes and stir until mixture comes to a boil. Reduce heat to low and simmer, uncovered, for 12 minutes (stirring occasionally). Stir in fish and cook 5 minutes. Remove from heat and stir in parsley, 1 1/2 tsp salt and 1/2 tsp black pepper. Serve with the prepared crackers. 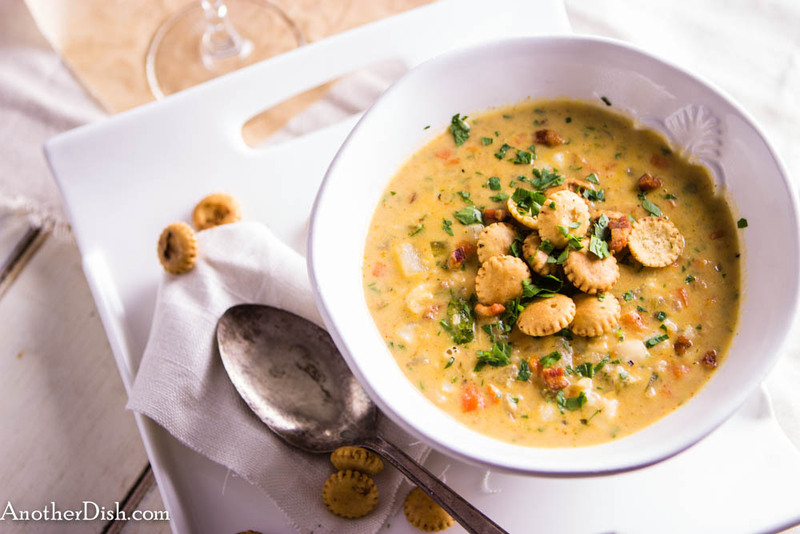 This entry was posted in Comfort Food, Main Dishes, Seafood and tagged American, Comfort Food, Cooking, Food, Food Photography, Foodie, New England Fish Chowder, Recipes on May 25, 2014 by AnotherDish.